Here is a great true story told by Evelyn Splane's the younger sister that helps illustrate the story of Gideon. Two little sisters joined hands and skipped down the well-worn path to their playhouse. To the girls, their playhouse had real walls, not just a few sticks of wood in the shape of a square on the grass; and a real ceiling, not just green leaves and blue sky. "Ev," said Clara, reflecting on the Bible story their dad had read that morning, from Judges 6, about Gideon, "what's a fleece?" "I dunno," replied her sister, Evelyn. "Guess it must be a cloth, though, 'cause Gideon wringed it out." Clara gave a big sigh. "Sure wish I knew what a fleece is." "Why?" Satisfied with the ribbon she had been struggling with on her doll's bonnet, Evelyn wrapped her in a blanket. "Because I want to know for sure if I'm s'posed to go to Africa to be a missionary. It would be terrible if I got way out there, then found out I belonged in China or somewhere else. If Gideon found out that he was s'posed to lead the army by seeing if there was water in his fleece, I can find out if I'm s'posed to go to Africa the same way. ... If I on'? Knew what a fleece is." Evelyn jumped up from the ground. . ."I should find out if I'm s'posed ta go ta India, too." She put her finger to the side of her face. "A fleece must be a cloth, though." "I guess it is." Clara rose slowly from the ground, letting out a long sigh. … "Let's put out a cloth tonight... Here." She pointed to a spot. "And see if it's wet in the morning. If it's wet, we're s'posed to go to Africa and India. If it's not, we're s'posed to go to some other countries." "But we need two cloths," said Evelyn, looking at the spot on the ground. "One for each of us." "That's right." Clara swooped down and snatched at her doll's blanket. "We could use Peggy Anne's and Eva's blankets." "But . . . But they'd be cold tonight." "Oh Ev. They're only dolls. Besides, they can sleep with us." "No! I don't like a doll in bed with me, and I won't let Eva sleep all night without a blanket." She hugged her doll to her. "I'll tell you what," said Clara. "We can't wring out cloth very well anyway. We'll get two tins and put them here ... to get water in." Again, Clara pointed to the spot. "It was God that put water in Gideon's fleece, and He can put water in our tins if He wants us to be missionaries in India and Africa." The girls turned and ran from the playhouse, letting their dolls tumble to the ground. Running to the garbage at the back of the shack, they rummaged around, finding two tins. A few minutes later, they were scampering back toward the playhouse, a Nabob coffee can and a Empress strawberry jam can in their hands. The girls set their tins in place, picked up their dolls, and headed back to the house. "Clara?" Evelyn grabbed her sister's arm, pulling her to a stop. 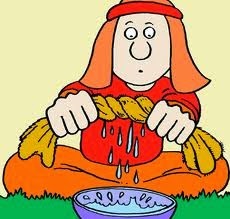 "When Gideon put his fleece out to get water in it, didn't he pray that God would make it wet, so he'd know if he was s'posed to lead the army? We should pray, shouldn't we?" The girls joined hands. "Dear God," they prayed together. "Put water in our tins, if you want us in India and Africa. Amen." Still holding hands, they skipped up the path toward the house. The next morning just as the sun was peeking over the horizon, Clara and Evelyn raced each other to the window. "Oh, Ev! It rained! It rained!" Still in their nighties, the sisters ran down the path to where two tins, spilling water over their brims, waited for them. God's eye was on those sisters. He kept them in His will. Yes! * *Clara went to Africa, and Ev's land is India still. Dear Lord, we pray that our eyes would be open to what You want for each one of us. When we see the fleece is wet or the tie is full help us follow what You have for us. In Jesus’ Name, Amen. 5 But if anyone obeys his word, love for God is truly made complete in them. This is how we know we are in him: 6 Whoever claims to live in him must live as Jesus did. 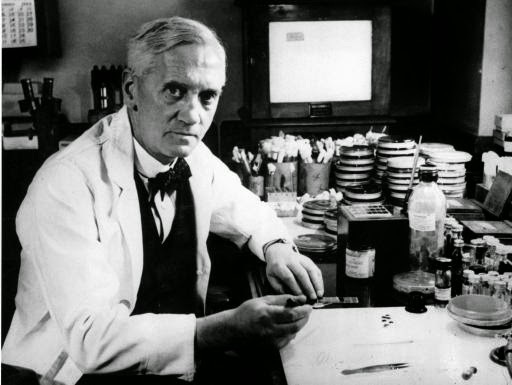 Alexander Fleming was born at Lochfield, Scotland on August 6th, 1881. He went St. Mary's Medical School, London University and at St. Mary's, he began research under Sir Almroth Wright, a pioneer in vaccine therapy. In 1928, while working on influenza virus in his cluttered laboratory, he observed that mold had developed accidentally on a staphylococcus culture plate and that the mold had created a bacteria-free circle around itself. He was inspired to further experiment and he found that a mold culture prevented growth of staphylococci, even when diluted 800 times. He named the active substance penicillin. Soon after introducing penicillin, Sir Alexander warned against taking too little of it. An underdose, he said would permit germs to remain in the system thereby allowing one to build up an immunity to the drug. These immune germs could be "passed on to other individuals so that the thoughtless person playing with penicillin treatments may be responsible for the death of another" if not himself as well. You must carefully follow the directions for penicillin for it to work correctly. Don't just claim to love Jesus, obey Him and follow Him. Dear Lord, thank You for our life that You have given to us. Help us live our life to bring honor to You. In Jesus’ Name, Amen. On a farm, there was a family who had two separate fields, in which they grew sunflowers. The father of the household, told his daughter(s), Maria, to take care of one side and Kelli the other. Maria and Kelli set out to work at 6 a.m., to get to work. Maria took the right side and Kelli took the left. 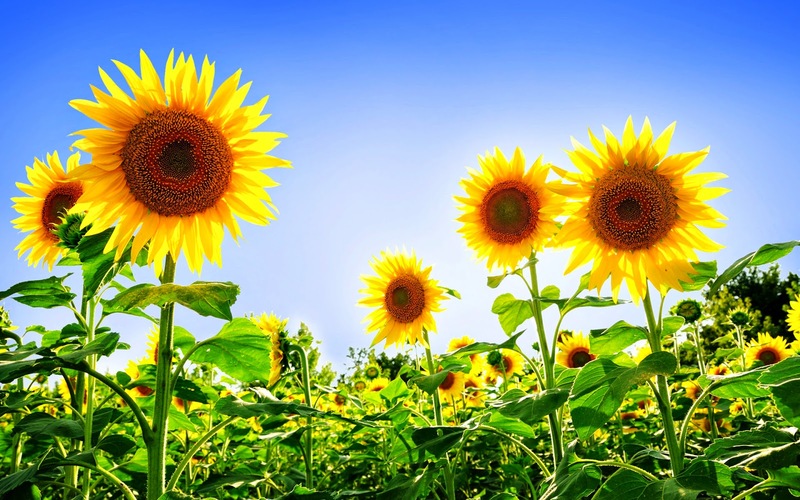 The first week, they both plowed the ground and made sure that there was just the right amount of rows, so that there would be an equal amount of sunflowers; they didn't stop working until all the work was finished. The second week, they planted all the seeds and made sure that they were sowed deep enough, so that they would grow to full height. They also made sure that every row had enough water. After they had planted all the seeds, they had to wait and wait, until all the flowers began to grow. Within the right amount of time, all the sunflowers had reached the perfect height. Maria and Kelli had much to do so that the flowers would stay alive. On the right side of the field, Maria got up extra early to make sure that there were no weeds and that each sunflower was watered. On the left side of the field, Kelli thought maybe she would wait for a few days before she went outside to inspect the flowers. The days kept getting further and further and Kelli slept in and she told herself that she was going to get around to the flowers, but never did. Her side was full of weeds and the bugs were making homes near the flowers and the garden started to die, because they weren't receiving enough water and proper treatment. Maria knew that if she didn't get her side done, she wouldn't be obeying her father by taking care of what was entrusted to her. Her garden was becoming more and more beautiful as each day passed and everyone complimented on how beautiful each and every sunflower looked. Kelli asked herself, "Why doesn't my side look pretty?" Maria thought to herself, "I will keep working for my father and not give up, because I know that He watches over my garden." Are you working for our Heavenly Father and doing your best? Dear Lord, we pray that we would stay focused and take care of what You have put us in charge of. In Jesus’ Name, Amen. I found this cute story that illustrates this verse so well. I hope that this hits home today for you. "Rules are for your own good Friskey." He would say. "They are not there to harm you, but to keep you from harm." Friskey knew in his heart Farmer was right, but for some reason, just had to break the rules anyway. Well, unfortunately, today was one of those days! 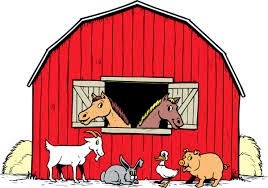 In the middle of the game, Friskey asked the others if; they wanted to sneak up into the loft of the barn? He said it would make a great "ship." Now, all the animals knew they were not permitted to play in the loft. It was for safety reasons. If one of them fell, they could get seriously hurt. They knew this, but without thinking it out, they said, "Yes, let's do that!" All, but Missy. Missy was not sure of this game any more. She looked up at the loft, and remembered the words of Farmer. "Stay out of the loft kids. It is very high up, and if you should fall, you could get very hurt. I would not want that to happen to any of you. I love you too much." Missy knew it was wrong to do, but she was afraid to say anything to the others. After all, she was new, to the Barnyard and so little also. Why would they listen to her, or for that matter, even care what she had to say. This was a new dilemma for Missy. If she went along with the others, she would be wrong to do so, and be breaking the rules. That could mean big trouble with farmer, not to mention her Mother also. Yet, on the other hand, if she did not go along, the other kids would call her "chicken," and not want to play with her at all anymore. "Oh," thought Missy, "What do I do?" Missy watched the others start to the stairs that led up to the loft. They all turned and saw her just standing there. "Well?" They asked, "Are you coming?" "No, I am not." Said Missy, with a slight quiver in her voice. "And you should not go either! Farmer told us it was off limits!" Her own words shocked her! "Where did that come from?" She thought. The other kids looked at her, then at Friskey. Suddenly, they were faced with the same dilemma Missy had faced. Do they go along with Friskey, or, like Missy said, not go, for it was breaking the rules? "My Mother told me that as for her and her house hold, we were going to obey, and serve the Farmer! I love Farmer, and I know he loves me. I will be obedient to him and my Mother. I'm leaving!" With that said, she turned around and walked out of the barn, into the sunlit yard again. It was not until she was quite a ways from the barn; that she turned to see them all following her out; even Friskey was coming out. The other kids thanked her for being bold enough to stop them from doing something wrong. Missy told them, "Your welcome, but even if I had walked out here alone, I would not have done what I know was wrong to do. I hope you all did it because it was the "right" thing to do. Farmer will be pleased with us, no matter what, but it pleases him even more, if we do it with the right motives." "Let's do it". That; does not make it, the "right" thing to do! Dear Lord, help us be strong and do the things that we know are right. Help us not give into the peer pressure around us. In Jesus’ Name, Amen. The story is told of an American tourist who was traveling in the Mid East. He came upon several shepherds whose flocks had intermingled while drinking water from a brook. After an exchange of greetings, one of the shepherds turned toward the sheep and called out, "Manah. Manah. Manah." (Manah means "follow me" in Arabic). Immediately his sheep separated themselves from the rest and followed him. The shepherd smiled knowingly as the traveler wrapped himself in the cloak, put the turban on his head and called out, "Manah. Manah." The sheep did not respond to the stranger's voice. Not one of them moved toward him. "Will the sheep ever follow someone other than you?" The traveler asked. "Oh yes," the shepherd replied, "sometimes a sheep gets sick, and then it will follow anyone." We live in a world where a lot of different "voices" are calling us to follow. Materialism cries out for us to follow. Power and prestige call out. Sensual pleasure makes its plea. It's easy to be pulled in a lot of different directions. That is, unless we have Jesus Christ as our shepherd. 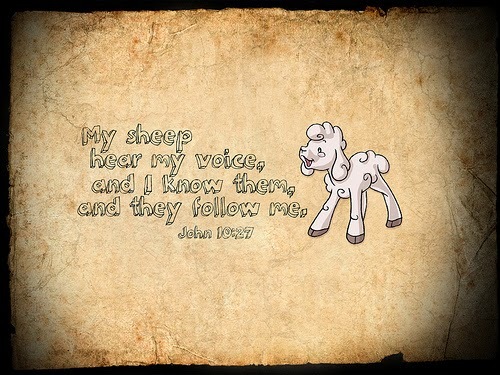 A sheep in His flock will ignore all other voices and listen for the voice of its Master. Dear Lord, help us listen for Your voice today. Let us not let the distraction of this world get in the way of us hearing Your voice. IN Jesus’ Name, Amen. ‘For in him we live and move and have our being.’ As some of your own poets have said, ‘We are his offspring. One of nature's greatest sights is the hundreds and thousands of birds gathering in autumn for their winter migration. Another of nature's great marvels is how they reach their destination. 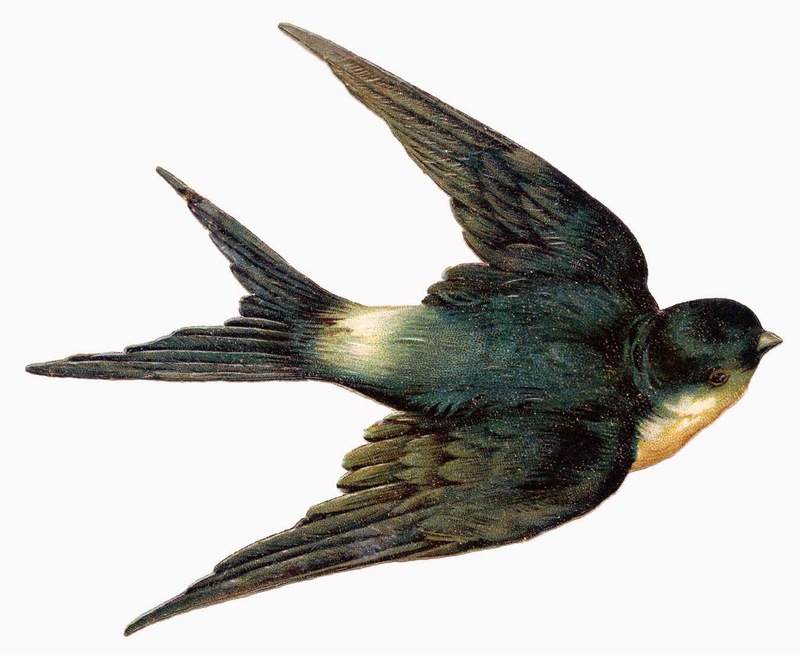 One of the best known of the migratory birds is the swallow. Leaving southern Africa at the end of the southern summer, it flies to northern Europe, where it raises two or three broods and stays until autumn. Like its relative, the house martin, it is well suited to long-distance flight, because of its slim, streamlined body and curved, narrow wings. The house martin, like other birds migrating over the sea, often hitches a ride and well-earned rest on passing ships. In large flocks, it is reasonable to assume that experienced adult birds guide and teach the young on their first migrations. Knowledge is passed from generation to generation, just as with human beings. However, some birds migrate singly, and so possess an instinct, giving them direction. God's creatures -- both human beings and animals -- have always used His other created wonders such as the sun, moon, and stars in navigation and travel. Birds also seem to use the earth's magnetic field along with some sort of built-in magnetic compass, enabling them to find their direction. As well, they may recognize familiar landmarks to find their way, which is essential to their survival. In the same way, moving on in development and right direction with God is essential to us as God's children. God always desires us to move on with Him, and we have the wondrous thermals of the Holy Spirit to give us directions in every way we should go. As we respond in obedience to God's moves, we will bear much fruit in our lives for His purposes and for His glory and honor here on earth. Dear Lord, help us develop the migratory instinct to obey Your commands and promptings to move on with You wherever You lead us. In Jesus’ Name, Amen. Darkness, light, O Heaven's art! A wound of His a counterpart! Afraid-of that? "Shall we beat a retreat, and turn back from our high calling in Christ Jesus; or dare we advance at God's command in face of the impossible? Let us remind ourselves that the Great Commission was never qualified by clauses calling for advance only if funds were plentiful and no hardship or self-denial involved. On the contrary, we are told to expect tribulation and even persecution, but with it victory in Christ." The day of reckoning came for John and Betty Stain. They were captured by Communists (their little baby, Priscilla, was miraculously spared), then painfully bound, stripped down to their underwear, and kept under guard for the night. The next morning, they were paraded down the street while being mocked and ridiculed, after which they were beheaded-baptizing with blood a stony plot, till souls have blossomed from that spot. They were not afraid of that! As word got out about their martyrdom, the impact was dramatic, both in terms of new missionary volunteers, new student prayer meetings, and large monetary donations to the work in China. 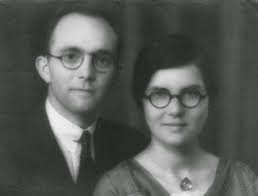 A missionary with the China Inland Mission wrote to Betty's parents: "A life which had the longest span of years might not have been able to accomplish one-hundredth of the work for Christ which they have done in a day." That is the power of martyrdom! Jesus said, "I tell you the truth, unless a kernel of wheat falls to the ground and dies, it remains only a single seed. But if it dies, it produces many seeds" (John 12:24). One short act of obedience to death gave many others eternal life! Dear Lord, help us be the witness for You that we should be. We thank You that no matter what the circumstances You can use them . In Jesus’ Name, Amen. Here is a story that comes from India, somewhere around the 1850s. The location was the home of the British Governor-General who had invited the important folks of the British community to join him in celebrating the Queen's birthday. While the adults were preoccupied with talk of matters political, the children were free to wander the grounds and play. Every once in a while one of the little ones would interrupt the adults with a question, an argument which needed to be settled, or a scraped knee which had to be comforted. That's why nobody paid much attention when a three-year-old wandered in with a prize in his hand. Nobody paid much attention until someone noticed the child was holding a small, poisonous snake: a Russell's viper. The child's father, with as calm a voice as he could muster, said, "John, put that down right this minute." Now John might have thought his father was just trying to spoil his fun. He could have run away clutching his treasure. He could have debated or negotiated his father's request. If he had pursued any of those alternatives, in all probability, he would have died. Instead, John did as his loving father had asked. He set the snake down, and he lived. It hardly needs to be said that the little boy is an excellent example for all of humanity. Like him, we also ought to listen to our loving Father as He speaks to us in Holy Writ, as He lays out the path for our salvation. When our Father commands, "Leave this sin alone," we ought to take note. When He says, "This is My beloved Son, listen to Him," we ought to pay attention (see Matthew 17:5). When Jesus says, "Believe on Me and you will never die," we ought to be thankful and put all our hope of salvation in His nail-pierced hands. Dear Lord, thank you for loving us enough to send Your Son to be our salvation. We pray for a new heart that is in harmony with Your will. Help us lead other to trust You before it is too late. In Jesus’ Name, Amen. Sue* was a good girl. Though her father rarely darkened the church doors, her mother made sure she and her brothers attended. She accepted Jesus as a teenager during a church revival and after graduation married her high school sweetheart. They soon entered full-time Christian ministry. But somewhere along the way, Sue began to change. Her love for church dwindled, and her new friends were bad influences. She began experimenting with sinful behaviors which accelerated her downhill slide. Eventually Sue walked out on her family. If you were to see her today, her sadness is evident even though she smiles and pretends to enjoy her new lifestyle. David once ventured into forbidden areas and discovered what Charlie did. Sin never delivers what it promises (II Samuel 11). He attempted to enjoy life by hiding lies, sexual immorality and murder but received only depression and God's discipline (II Samuel 12). He learned obedience was more profitable. 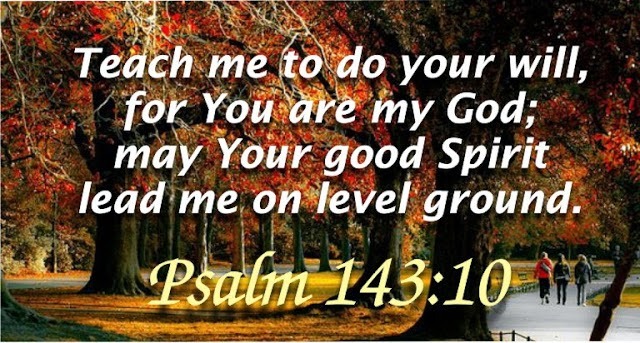 Teach me to do your will, for you are my God (Psalm 143:10 NLT). When it becomes evident we're depressed, we should immediately examine our relationship with God to determine if sinful behaviors are causing it. 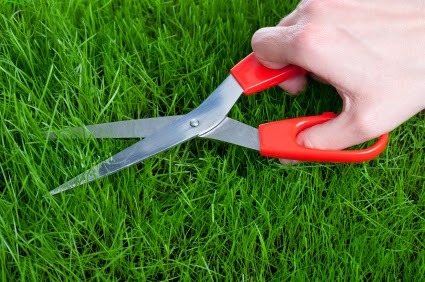 Disobedience can be a major cause of a believer's depression. Anytime we choose to walk away from God in any area or willingly defy his commands, an emotional struggle develops. If not quickly settled through confession, the emotional war will be lost to depression. Sin always takes us farther than we want to go, keeps us longer than we want to stay and costs us more than we're willing to pay. If you're struggling with depression, determine if there are any areas of rebellion in your life that need confessing. Dear Lord, we pray that You would reveal any areas of rebellion in our live. Help us turn them over to You so we can be the people You want us to be. In Jesus’ Name, Amen. In March 1939, Japanese Consul-General was sent to Kaunas to open a consulate service. Kaunas was the temporary capital of Lithuania at the time and was strategically situated between Germany and the Soviet Union. After Hitler's invasion of Poland on September 1, 1939, Britain and France declared war on Germany. Chiune had barely settled down in his new post when Nazi armies invaded Poland and a wave of Jewish refugees streamed into Lithuania. They brought with them chilling tales of German atrocities against the Jewish population. In June 1940, the Soviets invaded Lithuania and soon after ordered all foreign embassies to leave. Three times Sugihara wired Tokyo for permission to provide Japanese visas to Jews; three times he was rejected. Sugihara, a committed Christian, had to choose between his job and those whose lives hung in the balance. For 29 days, from July 31 to August 28, 1940, Mr. and Mrs. Sugihara sat for endless hours writing and signing visas by hand. Hour after hour, day after day, for these three weeks, they wrote and signed visas. They wrote over 300 visas a day, ultimately his work saved 6,000 Jews. 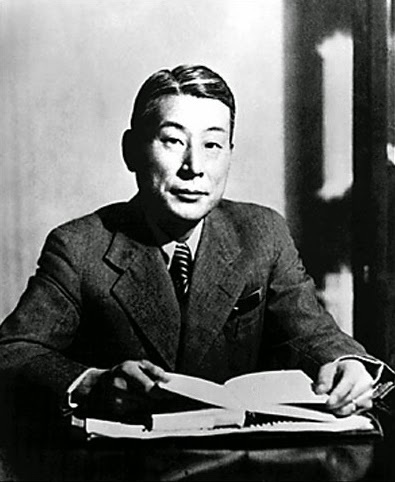 Back in Japan, Sugihara's remaining days were spent selling light bulbs. When his story was finally told, his son was asked, "How did your father feel about his choice?" "My father's life was fulfilled. When God needed him to do the right thing, he was available to do it." The Lord encourages us to be strong and to obediently follow Him. Dear Lord, thank You that You never leave us alone. Help us seek to follow You in all that we do. In Jesus’ Name, Amen. "Hey, Frank! Did you hear the latest news? All civil and government agencies have been shut down. Our government has decided that from now on people have the right to be completely free from any laws that our country has passed. We won't be voting for political parties any longer, as there won't be any, and we won't have to pay taxes!" "Wow, Henry! I wonder how this will turn out!" "I don't know, but lawyers, teachers and police men are facing some rough times. They have all lost their jobs!" "That doesn't sound good at all! I better go straight home-just as soon as I find a gas station!" Five minutes later Frank pulls into the nearest gas station. His jaw drops open in shock as his eyes scan the sign advertising the price. "What . . . ? Gas has jumped from $3.00 a gallon to $200.00? What a rip off!" "Calm down mister," calls out the attendant. "I have to make a living, you know, so I have decided that from now on I will have a fixed gas price! Nobody's going to dictate to me how much I can charge for my gas! If you don't like my prices, there are other gas stations!" He chuckles wildly. "Just be aware that they seem to be after a much bigger profit than I am!" "Bigger profit than $200.00 a gallon?" Frank sputters. "Unbelievable!" As Frank arrives home, he is shocked to see a total stranger dragging his eight-year old son out of the house. His son is screaming at the top of his lungs, and Frank immediately tries to intervene: "Hey! What are you doing with my child?" "Your child? This ain't YOUR child!" Roars the stranger. "Just ask my son and he will tell you!" Frank cries. "And this is my house, too!" "Kids lie! I decided about 15 minutes ago that this would be my child, so now he's mine! He just ain't learned it yet!" "All my life I've dreamed of having a child. Now I have one, and you can't do anything to stop me!" "I can't? But . . ."
"By the way, I'd say you would better spend your time getting ready for the drug crowd than trying to take MY child." "Drug crowd??? What are you talking about?" The stranger laughs wickedly. "If this is really 'YOUR' home, then there are about 100 teenagers in there claiming that it is 'THEIR' home. And the whole lot of them is pretty high, if you know what I mean." "But . . . But . . . I have to call the police!" "Go ahead! There is no more police, remember? We are free to do as we want from now on!" Then the sordid stranger turns his attention to someone else: "Hey, Bob! Wait for me! I need to take my new kid home!" As Frank turns around, another total stranger drives off with his car and his cell phone, which he stupidly left charging on the front seat. Not knowing what to do, he begins to run down the street, heading for the nearest pay phone. Fingers shaking over the number pad, he dials the first number that comes to his mind. "Frank? Frank, is that you?" Oh no! He's dialed his boss's number! Well, it's too late now, and hey, maybe his boss can help him! "Yes, it's me! Hey! I need help and I don't know what to do! I just lost my house, my car, my cell phone, even my son! I don't even know where my wife is!" "Oh, hi Frank. I'm so glad that you called. I needed to tell you about your new salary, effective today. I need to make a living too, you know, so I have decided that your annual income from now on will be $50.00." "Fifty dollars a yea . . . But . . . But . . . You can't do that!" The next few weeks are a living nightmare. Frank finds out that all his savings are gone. It seems the bank manager has decided to close down all of his banks and live on the deposits of his former customers. When Frank finally finds his wife, she has been abducted and abused. Everywhere he looks there is chaos. 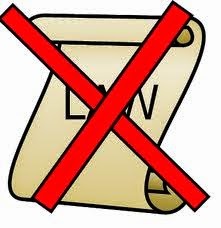 All laws have been abolished; there are no leaders in the country, and no law enforcement officers. It seems that all of these things have become "old fashioned", and the result is utter mayhem. Is there any hope for the future? Would you like to live in a country like Frank's, where people are completely free to do as they wish? Is it really worthwhile to criticize authorities, when in all reality, we wouldn't be able to do any better? This message is not meant to approve tyrannical governments who rule with an iron fist. They will have to face God's judgment seat one day. Still, respecting authorities, no matter how bad they are, can be a true witness to those who don't know God. Remember, when Paul wrote the above letter to Titus, he was in prison in Rome, under Roman authority. Paul realized that even a Roman prison was better than a lawless society! Dear Lord, thank You for the leaders that lead us even if we don’t always agree with them. Help us to pray daily for them that they will look to you for the wisdom and guidance that they need. In Jesus’ Name, Amen. And this is true for anyone who chooses Christ. This means that anyone who belongs to Christ has become a new person. Will today be the day that you give it all to the Lord? Make the big switch and be what God wants you to be. Dear Lord, we want to thank You today that we can be a new creation. Help us turn from our old ways and look to You in everything we do. In Jesus’ Name, amen. World War III was almost declared a couple of years ago. A young couple touring New Zealand rented the services of a helicopter company to fly to White island, a surreal place that is actually an active volcano. The couple enjoyed their outing, and to preserve this once-in-a-lifetime occasion, the husband took plenty of pictures with his digital camera. When it came time to fly back, he amused himself in the helicopter by reviewing his White Island pictures. Some of them turned out far better than he had anticipated, and he couldn't help boasting a little. Overcome by curiosity, his wife asked if she could review the pictures. He dutifully passed the camera to the back seat, and she spent the next half an hour reviewing them one at a time. She had only gotten halfway through when her husband spotted more photo opportunities, and promising she could have the camera back in a few moments, he reached for the camera. It's then that the husband (Not the volcano!) blew: "What did you do to my pictures?" He demanded. "I admired them," came the honest answer. "But half of them are gone!" "What do you mean, gone?" His wife asked. "I mean they have been deleted from the camera!" "I don't know how that could have happened," she responded, rather defensively. 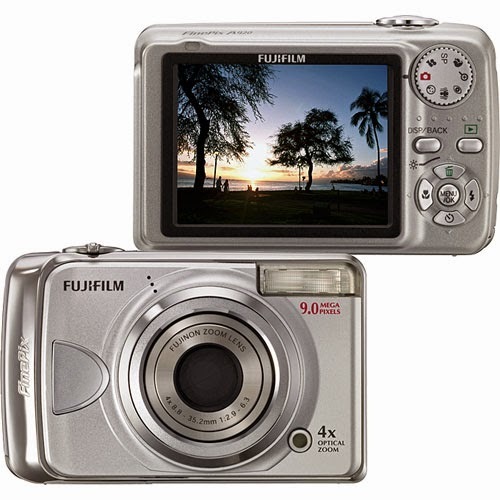 "The only button I pushed was the one that made the pictures advance!" Only too late did she realize that the button she had been pushing was not the "forward" button at all, but the "delete" button! Unfortunately for the poor pilot, what ensued was a rather heated argument that lasted most of the way back to the helipad, only to be followed by an angry, bone-chilling silence. I hope that this couple was able to reconcile. Otherwise, this day trip to White Island, which was supposed to be one of the highlights of their New Zealand trip, would be nothing but a bitter memory for both of them, and the remaining pictures on the camera would only serve to remind the couple of how they had very nearly been the cause of the beginning of World War III. In fact, this experience could very likely have ruined the rest of their experience in the beautiful country, because once bitterness creeps into the soul, it is there to stay. At least for a while! Maybe they should have read 1 Sam 16:23. Maybe, with this verse on their lips, they would have been able to drive that spirit of bitterness away. Reconciliation is possible, but only by focusing away from the irreversible problems: "And it hath come to pass, in the spirit of [sadness from] God being on Saul, that David hath taken the harp, and played with his hand, and Saul hath refreshment and gladness, and the spirit of sadness hath turned aside from off him." The right kind of music brings refreshment to the soul, lifting sadness and bitterness from the heart. The sad fact is that when we are feeling down, we become too focused on our problems to even contemplate worship music. But for those who do, sadness cannot take root in the heart. Dear Lord, help us not let the troubles in our live rule over us and destroy our joy. Help us focus on You in all things. In Jesus’ Name, Amen. Syndicated columnist Deborah Mathis wrote about a day in her life in our nation's capital. She told about passing through busy Union Station. The first thing stamped on her memory was the noisy hubbub of sounds. The public address announcer calling out arrivals and departures. Scores of pagers, walkie-talkies, and cell phones crying out for someone's attention. You could hear horns honking, machines clinking out change, and babies crying. There were voices from every direction. A nervous security guard yelled at a man about to enter a forbidden area. Three women stood up from their bench in order to press the points of their squabble with more emphasis. The man in line in front of her was pacing in tiny, agitated steps. Then she heard someone singing. "What a friend we have in Jesus, / All our sins and griefs to bear; / What a privilege to carry / Everything to God in prayer." And a perceptible change came to the cacophonous crowd. "O what peace we often forfeit, / O what needless pain we bear, / All because we do not carry / Everything to God in prayer." The quarreling women closed down their spat and quietly took their seats. Tense shoulders seemed to relax. As the lone voice sang the remaining verses of Joseph Scriven's lyrics from 150 years ago, Ms. Mathis realized she was singing along now. So were the three women who had been bickering. And several more. "Nice, huh?" offered the man who had been pacing his tiny, tight circle in front of her. "I don't even believe in Jesus, but that's nice." If your life has gotten too cluttered, remember that Jesus has invited you to his peace. Dear Lord, we thank You for the peace that You give to each. Help us to slow down and not get so wrapped up in the stress of the world. In Jesus’ Name, Amen. Ole Bull was born in 1810 in Bergen, Norway. At an early age he became known as a first class violinist. His solo performance with the great orchestra of the Paris Opera at the age of 25 marked the beginning of a series of concert tours that took him over the whole of Europe and America. In 1850, Bull founded the first Norwegian national theater. 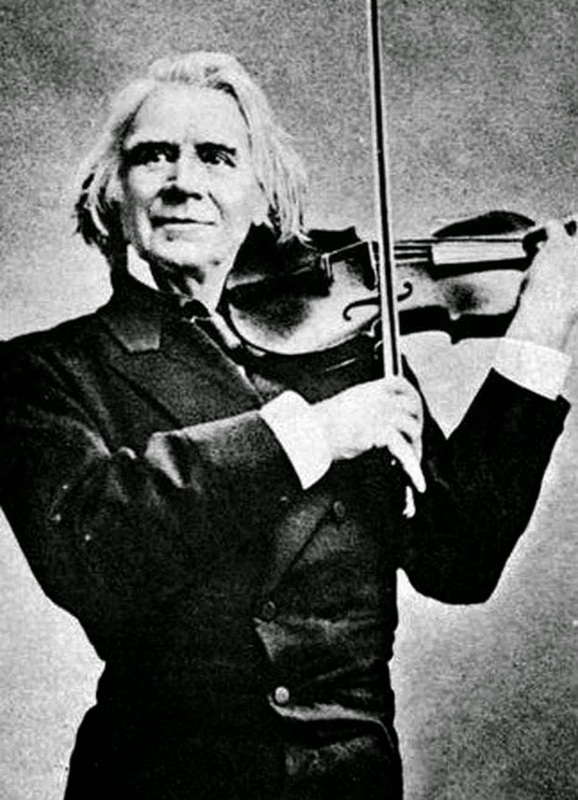 A celebrated composer, and an international ambassador for Norwegian culture, Bull also oversaw a line of fine violins named after himself. Bull had a friend Leif who claimed he didn't have an ear for music and he refused to go to Bull's concerts. The fact that his friend was world-renowned musician made no difference to Leif. However, Bull won him in the end. Ole didn't chastise his friend or belittle him. He didn't lecture him. He simply went to Leif's place of work and played for him. Leif heard the sweet sounds of Ole's violin and it melted his heart. Leif's rough, cold heart was transformed by the charm of the music. Jesus Christ has put a new song into our lives, a song of praise to Him. We need to praise our God and as we do, others will put their trust in Him. Are you praising the Lord throughout your day? Dear Lord, we give thanks to the You. Give us the chance through our praises to share the good news of Your love today. Help the hearts be warmed and ready to hear about Your love. In Jesus’ Name, Amen. Music can be so invigorating and uplifting, especially if it is directed towards praising God! Realizing this, Mr. Bowen volunteered to join Bishop Bompas in the Yukon. 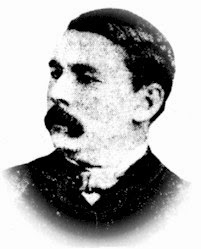 Little was known of the territory at that time, but Mr. Bowen became convicted that a musical instrument would be of help. It was difficult to choose which instrument would be the best, however, as it had to be one that was hardy, yet small enough and light enough for easy transportation. Unfortunately, this ruled out both the piano and the guitar! 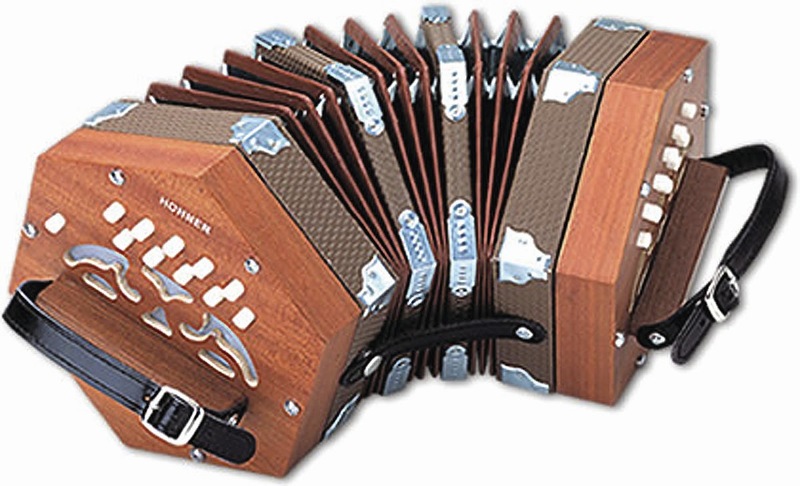 Mr. Bowen decided on the concertina, a small music instrument of the free-reed family, much like a miniature accordion. The only problem was that he had no idea how to play it! This didn't deter him however, and during his voyage north he ardently practiced this unusual instrument. Mr. Bowen's fellow passengers weren't overly happy with the would-be musician. Though he sought to produce heavenly music, the sounds that emanated from his cabin were far more like teeth extractions being performed by ill-tempered dentists! He was threatened with dire consequences if he continued to play; nevertheless, he persevered. His zealous, adamant practice paid off, however. Once in the Yukon, Mr. Bowen's little instrument brought endless comfort and pleasure to the many lonely, isolated people of the north territory. In fact, the mere sight of the concertina halted many an argument and fight, changing rude shouts to joyful singing. The concertina and its illustrious player also opened up many doors for sharing the Good News of Jesus Christ! 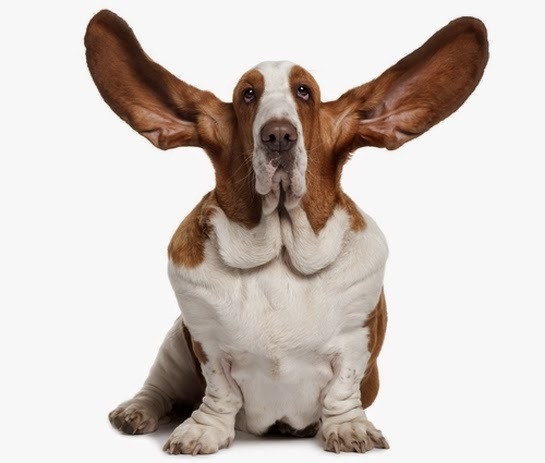 A stranger visited a church service one time, and when he heard the music, he stopped in his tracks, looked around bewildered and yelled "Where in so and so is the music coming from?" People never seemed to stop being amazed at the lovely sounds that emanated from that tiny instrument. It was like sound leading to heaven! I mean, let's face it! How can you look like a dried-up prune when singing to the glory of God? (Sad to say I know of churches whose members seemed to have simmered too long in the sun!) How can you continue to feel forlorn and depressed when there are sounds of praise resonating from you own throat? How can you continue to grumble and criticize others when music overtakes your heart? Is it possible that we focus too much on our sour circumstances instead of focusing on the joy of knowing Christ? Is it possible that we concentrate too often on what others are doing instead of concentrating on what God is doing? Let's sing continually to the glory of God. Let Him continually fill our heart with joy. Let us make music in our hearts and listen for God's response. Dear Lord, help us worship You with joy and let that joy show on our face. We thank You that You are worthy of praise and honor. In Jesus’ Name, Amen. Over the years I've learned a few important things about the finer points of positive motivation. Dear Lord, help us be mindful of those around us and the things they do. Help us be thankful and encouraging gto those around us. In Jesus’ Name, Amen.